The rarest of all hair colors, redheads already know a thing or two about standing out. Adding Rose Gold to this already unique look can be a truly head turning transformation. Riccardo Maggiore Color Expert and "Redhead Guru" at both Flatiron and Midtown locations Marcus Garcia states, “Of all the shades, redheads are the most stunning and you can’t help but look at them." He says, "Rose gold is a great color option for redheads who want a change while keeping their hair red." As Rose Gold already falls on the spectrum of red hair, it will take less effort to achieve this look for redheads. Riccardo Maggiore Color Expert Nancy Schreiber says she "Would still balayage or highlight on a redhead but there is less lifting in the process." 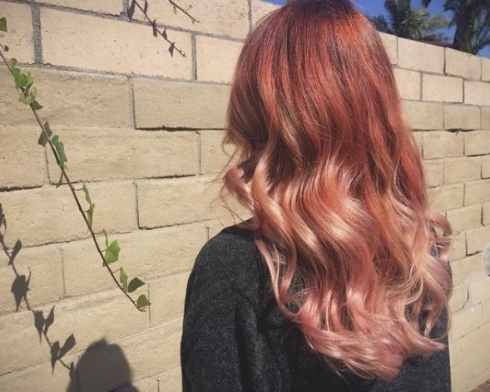 The result can be downright dazzling as in this glamorous Ginger Peach color. Garcia also says that "Fair skinned or 'peaches and cream' complexions usually make the best redheads." Natural redheads will also find they have a complexion perfectly suited for a rose gold look. Tints of metallic pink can diffuse seamlessly into a fiery hair color. Metallic Rose can be a beautifully subtle look that even celebrities like Emma Roberts can’t resist. And speaking of celebrities - our final blog next week will celebrate some of the music, film, and fashion icons who have embraced the Rose Gold hair color trend. Plus, some tips on products to maintain your Rose Gold look. Don’t miss it! We’ve discussed how blonde hair makes an excellent foundation for a rose gold look. But blondes aren’t the only ones getting in on this trend and there are plenty of gorgeous shades at the darker end of the spectrum. As with blondes, the first step is to address the base color. Riccardo Maggiore Hair Color Expert Sandra Yu says, “For darker brunettes, this means lightening the hair with highlights or balayage depending on the desired effect.” Lighter brunettes could skip this stage. Next, an overall toner is applied. This could be more reddish or pink depending on the look you want to achieve. Leaving the color on longer will produce more dramatic results and a longer lasting color. We call this one Chocolate Mauve. Another process might involve taking irregular sections of the hair and for more of a balayage effect. In the same way, you can customize the outcome by varying the shade and processing time. This lovely look is Chocolate Rose. You could also add more colors for a multi tonal Rose Gold effect like this Espresso Rose. Riccardo Maggiore Color Expert Bruce Conroy recommends using an Olaplex treatment during the process “To nourish the hair and ensure best results”. As you can see, brunette hair can produce some stunning results in the Rose Gold palate and we hope this has inspired you to add some Chocolate Mauve or Espresso Rose richness to your look. Redheads, don’t think we’ve forgotten you. Our next post will look at Rose Gold for Redheads. Join us next week! Blonde hair is a complimentary foundation to a rose gold look. Rose gold will appear more easily on blonde hair in the same way a rose blush will show more clearly on a lighter skin tone. It’s also a fabulous look for the change of the season .“Rose Gold color is a good entry way into spring since it will warm up your hair from winter tones,” says Color Expert Sam Alter. The first step in the process is to tone the hair gold and then overlay the rose gold color. There are a number of ways to achieve this, mixing a very light blonde/red gold with a medium blonde/red gold. With pastels, you might add a pink to a gold. The foundation could be lightened through highlights or adjusted through a glaze depending on your existing shade. For platinum blondes we recommend "Subtle & Fresh”. Mermaid Rose takes it up a notch for a more decidedly daring look. For blondes on the darker side we recommend "Strawberry Rose". This versatile look is very popular as it is both natural and stunning. Calling all Brunettes, the next blog post is for you. stay tuned as we discuss the most appropriate hair transformations for a darker hair type. From unicorn hair to a perfectly executed stencil, we’ve seen hairstyles go to extremes recently. However, the rose gold look is a trend we can get behind and our clients are just as excited as we are! 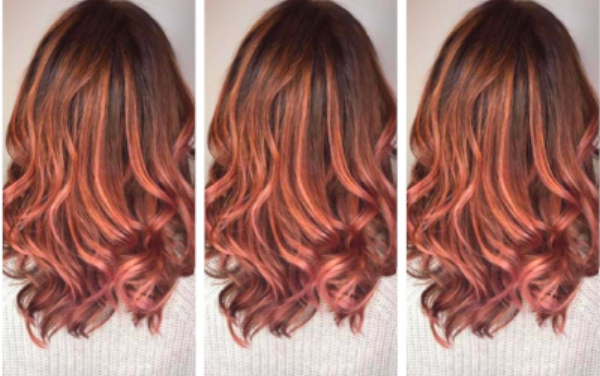 Rose gold is the perfect hair trend as you can go as light or dark as you please. It caters to each individual, functioning as a universal color through which one can play with the textures & warmth. Clients with varied hair types all ask for a different take on this gorgeous look. Most are enthused about undergoing a transformation but they don’t want to deal with maintenance or believe the look might not suit their lifestyle. What they don’t know is that there is a perfect rose gold for every hair type. Rather than experiencing a drastic transformation some will ask hairstylists to tweak their hair with slight tints of blonde and pink to make their own rose gold hair flair. Welcome to the Rose Gold Series, a sequence of blog entries which will explore this prominent color trend in depth. First on the list…blonde hair! In the next post we’ll be exploring some of the most popular blonde variations; Subtle & Fresh (for all you Platinums out there), Strawberry Rose and Mermaid Flair. We’ll also be asking our team of experts how to achieve these fabulous looks. Stay tuned! After a winter of bomb cyclones, thunder snow and bitter cold temperatures, we are ready for spring and all that it holds. We look forward to longer days, warmer weather, buds and leaves on trees and drab colors giving way to brighter ones. As the city takes on a new look, it's time to think about your own beauty transformation. Sleek, straight hairstyles may have ruled the red carpet recently but when it comes to everyday beauty for your lifestyle, we’re seeing a little more body and texture. Embrace those natural curls and waves and find a cut that will enhance them. Soft waves look great with longer layers and we’re loving curly hair with bangs, a trend that just keeps on climbing. Even if your hair doesn’t naturally have a ton of body, your look doesn’t have to be flat. Start with a solid silhouette and build in some light layering which will give you movement and volume. Whatever your hair type and texture, make sure you talk to your stylist to find a cut and products that work with your face shape and lifestyle. If you’re feeling nostalgic for the 90’s lately, there’s a reason. New York Fashion Week saw models for Alexander Wang sporting claw clips and Prabal Gurang models rocking comb headbands. Snap clips are also making a comeback on Instagram and we’re spotting celebrities wearing chunky velvet elastic bands (a/k/a scrunchies). Whatever accessories you choose, remember to keep it simple. Accessories should complement, not overwhelm your hair. In general it’s time to start warming up your color as we head into warmer months. Address any unwanted brassiness with a toner and get your hair shades back in harmony. It’s a great time to get a gloss color to give your hair an added glow. Balayage-inspired looks continue to dominate the color scene. Starting with a realistic base and adding a vibrant color on top means you’ll see less regrowth and won’t have to rush back to the salon for a touch up. 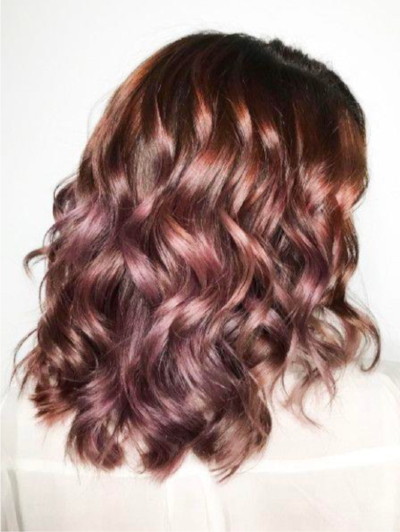 Blondes have been rocking the Rose Gold look for awhile but we love the and we love the brunette version of this trend - Chocolate Rose. With a rich brown base and reddish pink highlights painted on top, this look is both fun and elegant. If you’re feeling a little more bold this spring, the spectrum of shades is really as endless as your imagination. So don't be afraid to live in color! If you spent the winter taking hot showers & pumping up the heat, chances are your hair will need some help to repair and recover from moisture loss. A recent New York Times article recommends Oribe Gold Lust Pre Shampoo Intense to replenish moisture and we have to agree. This rejuvenating pre-shampoo treatment balm melts into hair, moisturizing deeply and repairing as it protects against harsh aggressors such as washing, styling and pollution. Restores strength softness and shine and are restored. Apply to dry hair (mid-shaft to ends) and leave on 20 minutes before shampooing. Use once a week for best results. Since spring is the rainy season, we also recommend a product to protect your hair from the elements. If you regularly blow-dry your hair, you’ll want to pick up Kerastase Discipline Keratine Thermique. This hair-smoothing leave-in styling treatment smooths frizz and fly-aways with humidity protection and restores inner flexibility. Apply it to towel-dried hair and then detangle before heat styling. Hot product tip for men - use a gel based product in the winter and spring and switch to a clay based product in the summer. You don’t want to use a gel in the summer when you’re adding sweat to the mix but it adds a nice shine in the winter months Be sure to run fingers through the gel to break it up before it dries. A clay isn’t quite as stiff but will still give you the control you need. Winter is HERE and your hair needs a CUDDLE! Heat-styled-hair needs protection and nourishment. If you flatiron or blowout your hair, Nectar Thermique will give heat protection while nourishing and sealing the hair cuticle for smoothness and shine. Keeping the cold weather out! Apply on towel dried hair and don't forget to blowdry as this is a heat activated product! Dry Dull hair needs moisture and a good mask like Creme Magistrale is an amazing leave in creme for extreme cases. If your hair needs some TLC Creme Magistrale can be applied to damp or dry hair giving extra nourishment and shine. Brittle, Sensitized or damaged hair Masque needs intense treatment and Magistral or Masquintense will give IMMEDIATE nutrition for dry or severely dry hair. This is a mask to use between your conditioning treatment. Simply apply in the shower, let it all soak in. It gives IMMEDIATE nourishment to solve any hair “frostbite” case. Riccardo Maggiore is proud to announce some exciting new additions to our team! Happy First Day of Fall! Also called the Autumnal Equinox because the equator passes the center of the sun, meaning day and night are nearly equal. From here on, it’s shorter days and longer nights. A change of season also means it’s time to change your look. Here are a few of the hottest hair color, hair cuts, and products to get you started. While rich tones like chocolates and chestnuts remain go-to colors for fall and platinum doesn’t seem to be going away any time soon (although we hear silver is the new platinum), the hottest color trend is… cream soda. This “sweet” color is a transitional blond shade with a combination of high and low lights. It can create a softer appearance for blondes but also works great for brunettes wanting to brighten up their look. Since it’s not an all-over blonde color, you’ll find less damage to your hair and more time in between salon appointments. Win-win. Emmy-winner Elisabeth Moss, Oscar winner Jennifer Lawrence, and Model Gigi Hadid have been seen sporting this color recently. Book your appointment to get your Cream Soda Color at one of the Riccardo Maggiore Salons. The bob is undeniably the look of the season. There are many Bobs to choose long, short, straight, wavy, textured, asymmetric, angled or try a bob with a bang. We often think of the bob as a chin length cut but if jaw-skimming looks aren’t your thing, a shoulder length bob (or just above the shoulders) is a great alternative. A bob can be smooth and sleek, but waves and curls work beautifully as well. A shorter cut can give fine hair the appearance of more volume and a layered bob can transform thicker hair. Emily Ratajkowski recently paired a long sleek bob with Vintage Chanel on the red carpet. She has also been seen with a wavy bob. Emma Stone debuted a chin length wavy bob with bangs on set earlier this month. The bob is a classic, universal look. With the right cut it can transcend age, face shape, hair color and hair texture. Visit one of the Riccardo Maggiore Salons, our experts will help you choose your perfect bob. As we move into fall there is less humidity in the air. This is when moisturizing becomes even more important. Plus if you’ve gone for a summer blonde or spent hours at the beach, you might be in need of a little therapy. Here are the must have products we recommend for the fall. This is a fabulous leave-in with sunscreens, botanicals and natural ingredients. It’s moisturizing and protects the hair from the sun, heat, and cold. We suggest Oribe Gold Lust Dry Shampoo. It’s light and smells fantastic. With a dry shampoo you don't need to wash as often, thus your not stripping the hair's natural oils. Masque Therapiste repairs the hair fiber at its core which allows it to regain strength and elasticity, leaving your hair toned and revitalized. Wash and towel dry your hair, then leave Masque Therapiste on lengths and ends for 5 minutes before rinsing out. A simple ritual will add shine and keep your hair and keep it luxurious . Note: Masque Therapiste is designed for thick hair. If your hair is fine, go with Kerastase Nutritive Masquintense. A classic with beautiful results. Pick up a jar of Masque Therapiste and the other products mentioned at one of the Riccardo Maggiore Salons. Hair is (most of the time) your most prized possession. Between washing, styling and using any product you can get your hands on, it seems like hours of your life are devoted to hair care. One of the worst problems is the dry and frizzy hair you're left with after excessive blowdrying and styling. And it feels like no matter what beauty products you use, your hair has a mind of its own. Lets be honest, no matter how cute your braid may be, nothing detracts from it more than the look of frizzy baby hairs sticking out all over the place. We know how much you long for that beautiful, silky, Pocahontas-like hair. Even after the whole “Colors of the Wind” spiel, her hair looked flawless. The question is HOW? If you want keep your hair flawless after your musical number in the wind, here’s the secret: hair serums. Hair serums, or oils, are products that create extra shine and gloss to your hair without the use of harmful heat techniques. They are mostly used as an extra addition to your normal hair routine to create that beautiful shine. Much like a setting spray for make up, it's often used as one of the “final touches” to tame any stray hairs. Salon owner and professional hair stylist, Angelo David, explains that “hair serums are based on silicone. They smooth your hair and give your hair a wonderful sheen—so in the end your hair looks healthier and shiny." In addition to a regularly healthy hair routine, hair serums add an extra boost that allows your hair to hold that shine you’ve always dreamed of! Hair serums protect the exterior of your your hair, coating them in moisture to prevent unwanted particles from harming it. We know what you’re thinking, why should you go the extra mile and purchase yet another thing for your hair? Although hair serums are great for adding shine, they also add a significant amount of longevity to your hair. Most hair serums/oils contain an ingredient called Keratin. Keratin is the protein that our hair is made of and protects hair from damage. Because most hair serums contain this vital protein, it not only saves damaged hair but it also prevents it. How can you achieve the best results from your hair serum? Unfortunately, hair serums alone are not enough to transform your hair into that beautiful Pocahontas hair. As much as we wish it could be that easy, hair oils are not magical (even though it may seem like it sometimes). The use of hair serums is most effective when paired with healthy hair habits. Hair Serums are not going to fix split ends. To get rid of them, cut them off and then keep your hair healthy. Hair serums will give your hair a smooth finish. When shampooing long hair, leave your hair down. Work up the lather at the scalp then carefully work through to ends of hair. Don’t brush your hair when it's wet. Many people seem to think that piling on a bunch of products will magically save their hair. Sorry folks, it’s not always that cut and dry (pun intended). Like most things in life, you'll have to work for it. But using hair serums will put you in the right direction. Are all hair serums the same? The answer is simple, no. Much like most products today, there is an endless range of products that are curated just for you and your hair type. Riccardo Maggiore, an NYC hair stylist, stresses the importance of hair serums to battle specific types of hair. “There's not just one hair serum for everyone," says Maggiore. "The best serum for you depends what you hope to achieve with the serum." In today’s society, hair serums are available in all shapes and sizes. While other serums target things such as heat protective qualities by containing ingredients such as Keratin that help protect the hair from the sun’s harmful rays. Okay so now that we’ve stressed the important of knowing what you’re looking for, let’s get to the real deal. The question lays, which one should YOU look out for? First, it’s important to recognize what kind of hair you haveand what kind of hair you want. It’s important to remember that no two hair types are the same. Everyone has different goals when it comes to their hair care, but with the help of a hair serum you can be one step closer to the locks of your dreams! Join us in congratulating our very own Stacey Smoker from our Flatiron location. She was selected as a U.S. semi-finalist in the Goldwell Colorzoom Challange. Click here to read more about it.